PuzzleMad: Even a Visit to Aaron's Dentist is Fun! Even a Visit to Aaron's Dentist is Fun! No one likes the Dentist......except me! 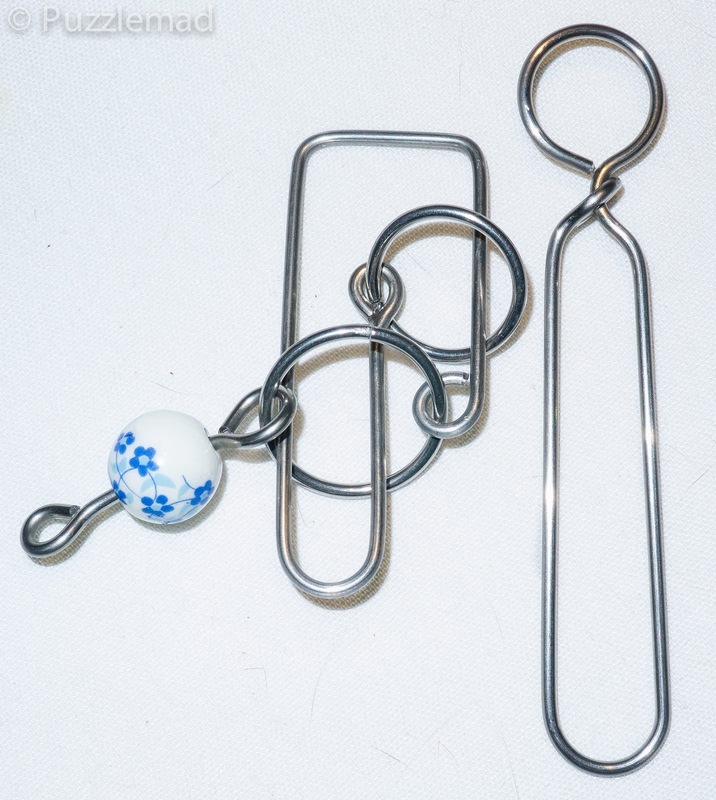 Back in March I showed off some new wire puzzles from Aaron King (aka Wang Yulong) and I have been working on them on and off ever since. I have of course been sidetracked by a few wooden things in the meantime and unfortunately work has got in the way quite a lot. 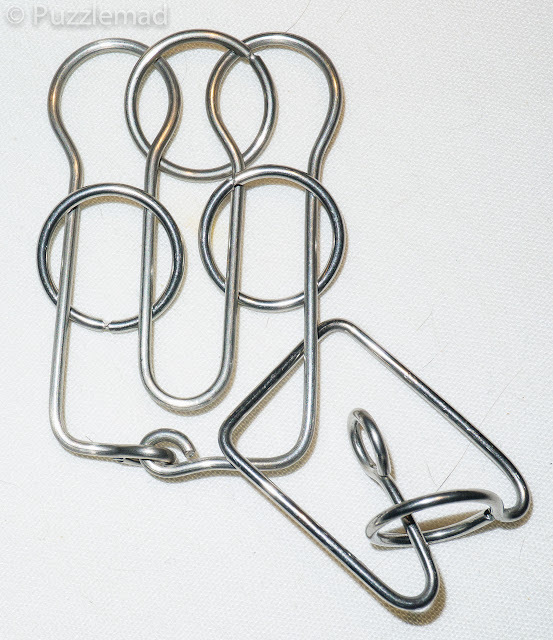 I have managed to solve a few of them and am stuck on most of the others - I actually think that Aaron might well be the most talented disentanglement puzzler in the world. 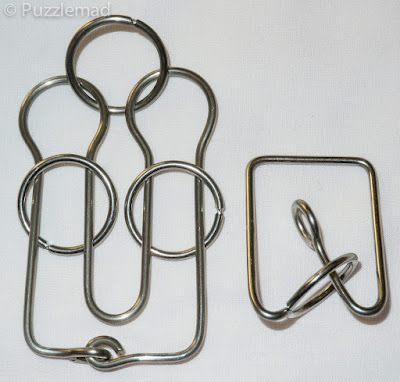 A friend of mine who knows him quite well has told me that he can solve almost all of these puzzles entirely in his head which is absolutely amazing. Aaron doesn't sell his puzzles direct to us, the usual place to get them is via the Felix puzzle store in China. I have dealt with them quite a few times over the last year or so and have had a very good experience each time. 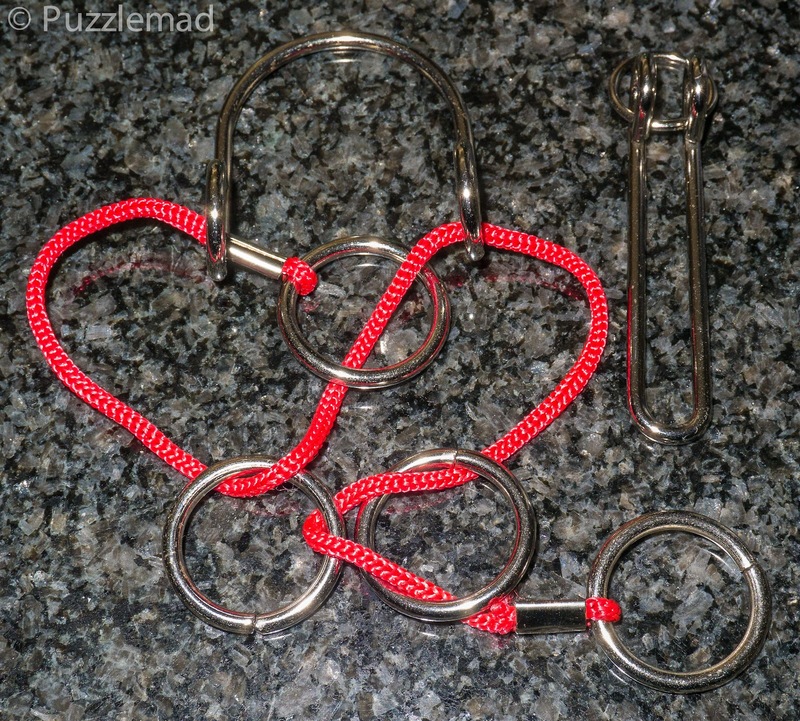 The puzzles I am showing here are not yet available on the store but hopefully will be available soon. The ones that are on sale were reviewed by me here and are simply brilliant. Also for a peek at possible future puzzles have a look at Goetz' page (date 2017-04-28) for some more which includes some wonderful looking and very advanced N-ary puzzles which I hope I will also manage to buy in the near future. 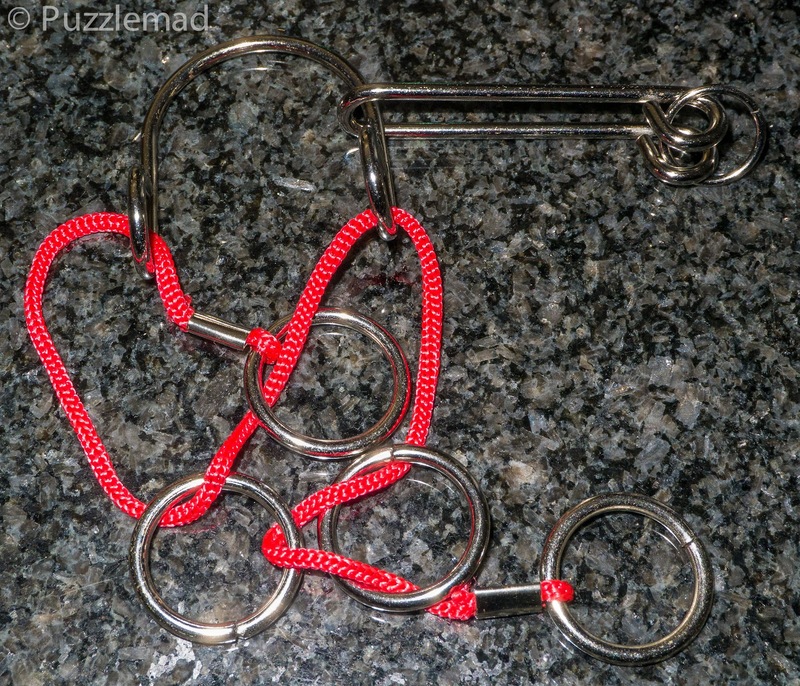 I actually started with the Calabash puzzle because it was supposed to be the easiest of the bunch I received. It is named after a bottle gourd and only after looking at the Wikipedia page could I see why. The aim is to remove the circular key piece on the right. It has been rated by Aaron as a level 7 and whilst I agree it was the easiest of the bunch, I would put it at level 6. The usual mechanism for the movement of these key pieces needs to be tried but the problem is that only the left hand U shaped part will fit. 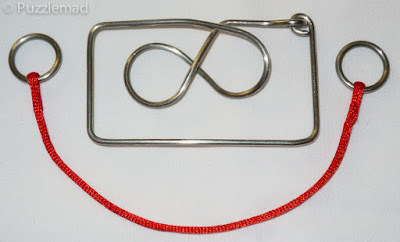 This leads to silly attempts at movements similar to the horseshoe puzzle and only after a little muttering under ones breath does a really nice Aha! moment occur. Another one very suited to kids or beginners but still enjoyable by old hands like me. Especially as I have shown myself not to be very bright many times! Looks almost trivial? Nope! There's a fun sequence. Pen - no idea why! 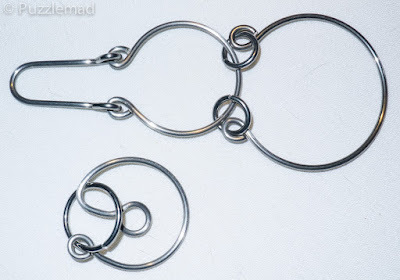 The Pen puzzle looks more like a lot of the usual run of the mill wire puzzles with the aim being to remove the elongated loop. 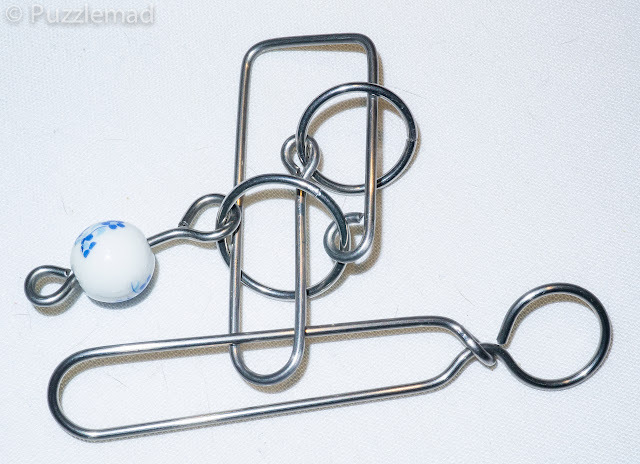 If it wasn't for the ceramic ball then this would be trivial and a puzzle even I could solve in my head. BUT that ball adds a whole extra dimension to the puzzle and gives it the well deserved difficulty level of 8 out of 10. I absolutely loved exploring this one and was delighted that there was a whole sequence of Aha! moments to it. This is one of my favourites. Again it is not too tough for a decent puzzler but probably out of the league of kids. Putting it back together after a reasonable delay was another brilliant challenge - not impossible but the slight hint of chest pain after 20 minutes of trying added a little frisson to the experience! No trip to the hospital this time though! Maybe the name of this shows Aaron's age a bit! Those of us old enough to remember floppy disks (especially the 5¼ inch version) will be able to see the similarity. This one looks remarkably easy but the given level of 8 should warn that it is definitely not easy. The aim is to remove the string and rings but a gentle fiddle quickly produces quite a tangle. 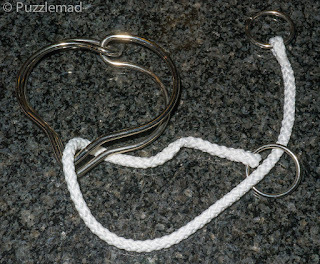 Luckily the short length of the string prevents getting into too much trouble but again that little hint of chest pain keeps you occupied! 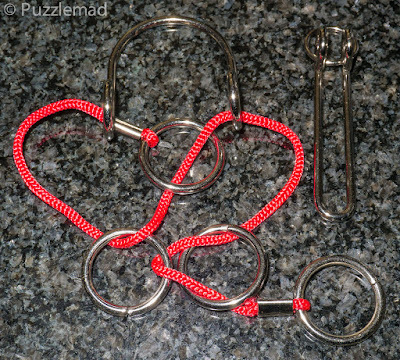 I realised quite quickly that the mechanism of the solution is identical to the Russian Heart puzzle (see below) which Mike D reviewed and recommended for us back in January. Now whilst Diskette is not available yet you should definitely have a look at getting Russian Heart from the Sloyd store. Once I realised that they shared a similar shape then I worked on the 2 of them together and had an absolutely fabulous Aha! moment. I have done both of them multiple times now and still have to stop and think to avoid getting tangled up! I'd probably give it a level 7 myself. The reassembly is also a nice confusing challenge as it is possible to loop things the wrong way and get a little twist in the wrong place - lovely! Stop reading this blog now and go and buy Russian Heart before Tomas sells out! Santa's socks is rated also as level 8 and I have agreed with that - the aim is to remove the horizontal loop that is tethering Santa's ankles together. yet again this puzzle is made considerably tougher by the simple addition of the 2 tiny rings on that loop. It seriously adds to the complexity and had me stumped for quite some time. I think that it might have taken me over an hour to work it out and then a seriously panicky extra hour to reassemble it as I could not work out how to get the rings back in place. My little notes for this one says just one word: FAB! 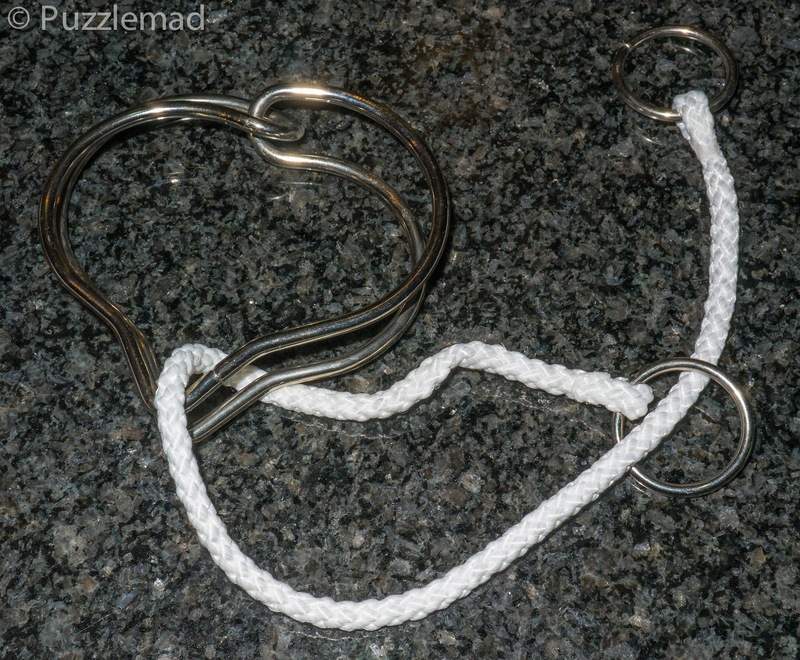 I adored this puzzle - it is just the right difficulty level for a regular puzzler like me. A genius like Aaron may be able to solve it entirely in his head but I suspect that he may not actually be human! 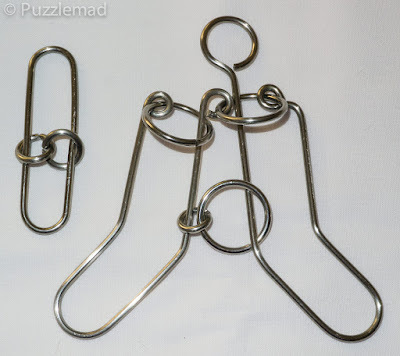 The other puzzles that I received and also some of the earlier ones have all involved varying lengths of string and I have so far singularly failed at solving them. I need a decent period of time without distractions to have a play but also Mrs S must be elsewhere as the jingling sends her batty and she is forced to commit violence upon my person after about 15 minutes. It may be that I will never be able to solve them but this makes them fantastic value for money! I bought a few disentanglements from Tomas a while back after Mike wrote his review. I have so far singularly failed to solve the amazing 4 Bague puzzle which means you should all buy it and tell me how easy it was for you and the N-ary disentanglement Ring Bottle has also stumped me despite the fact that it should be pure logic. What did surprise me was how much I enjoyed the Eureka Mini Wire Number 10. The aim is to remove the shuttle but there is a very large tangle of string in the way. It took me about 45 minutes to work it out and again the Aha! moment was marvellous. Only when I was taking the photos and looking through my catalogue did I realise that I already owned and had solved a version of this puzzle produced and sold by Puzzle Master. My excuse (apart from being pretty dense) was that it had been back in 2011 at the beginning of this journey of mine. The Annihilator puzzle was highly recommended then and I still recommend it. 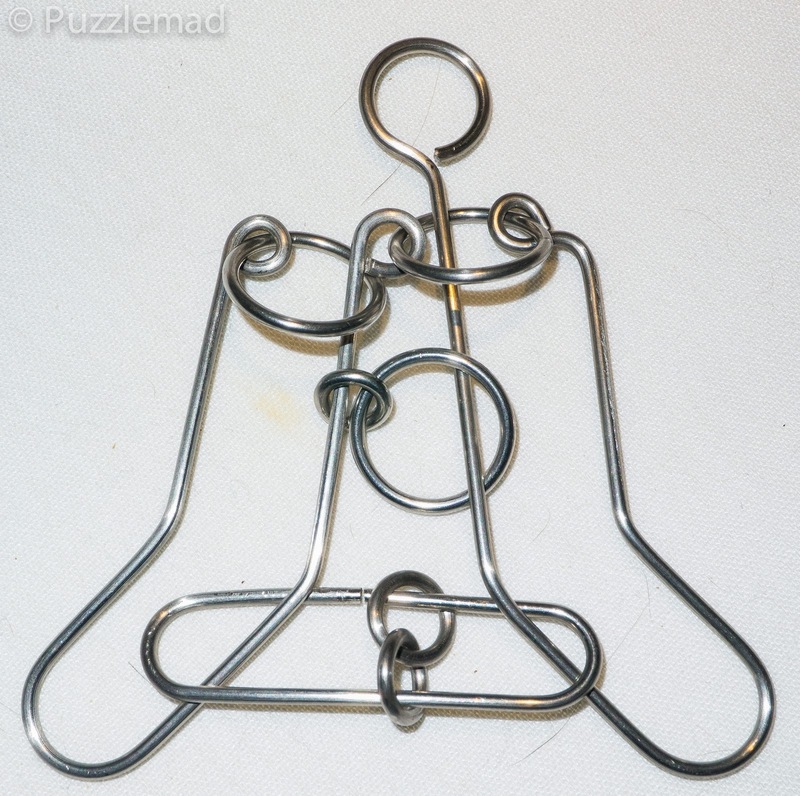 If you are in the US then buy from Puzzle Master and if you are in Europe then buy the slightly smaller version from Sloyd. 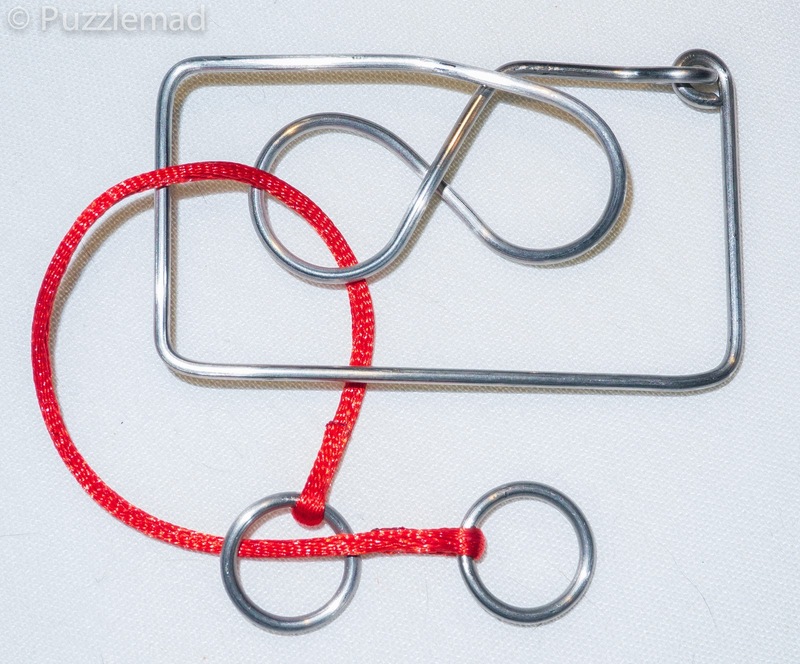 Even having solved it before it was still great fun. Don't tell Mrs S that I could go back to the beginning and solve all my old ones and not need to buy any more! Has the Snake Turned me to the Dark Side?